In this section, we'll discuss how to customize Jar to match your brand. The following topics can be found under the "settings" item of the dropdown menu (found under your name in the top right corner). Please note: Access to settings is for users with the role of "Administrator" only. To change your company details, select "Company Details" from the settings menu. The information included in this section appears in the footer section of emails sent out by Jar. To edit, simply select the "Edit" option in the upper right side of the company details box and click on "Update Company" upon completion. To change the logo that appears in the upper left corner of the Jar app and in Jar emails, select "Company Logo" from the settings menu. Once there, click on "Upload Company Logo" and select the logo you would like to use. Logos will look best with 3:1 width:height ratio. Image will be resized to be no taller than 30px. 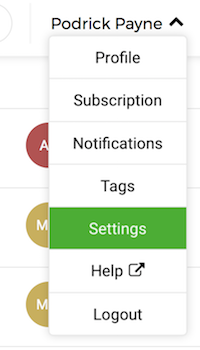 You can easily change the colors Jar uses by heading to the "App Design" section of the settings menu. Click on the color you would like to change and either select your colors using the color picker, or insert the hex or RBG value you'd like to use. 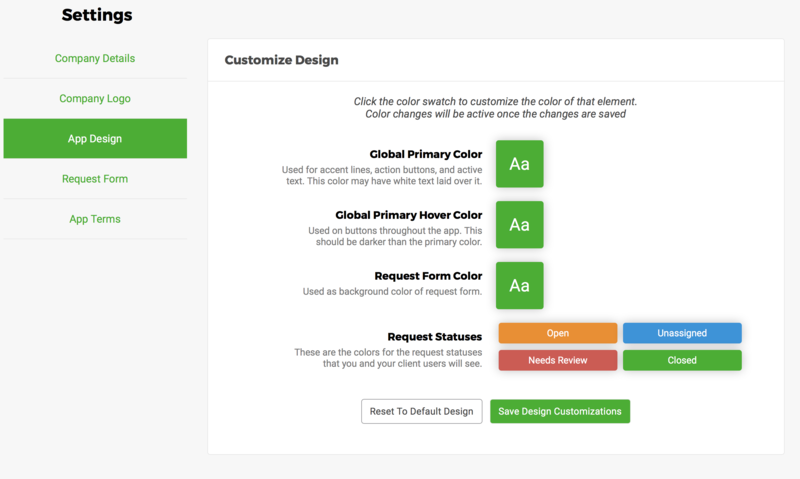 Upon completion, hit "Save Design Customization" and the application will now show the new colors. Customizing intake forms is handy when you need to collect specific information from clients when submitting a request. Be sure to click "Save Form Fields" upon form editing completion! To edit fields, click on the downwards arrow icon on a field. This will show an editable text field which can then be customized with your own text. The ability to add or remove a required field can be toggled by selecting or de-selecting the "required" checkbox under each field. To delete a field, simply mouse over the field you would like to delete and hit the "x". A pop-up will appear confirming you'd like to delete. If that is still true, select "OK" and the field will be deleted. Fields can also be easily added by dragging the icon of the field type you would like to add from the top and dropping it into place. Click on "Save Form Fields" once you're done editing the form. If you'd like to reset it back to the default, select "Reset to Default Form". You may also preview changes if you'd like. Don't serve clients per se? Change what you call your clients by heading to "App Terms" in the settings menu and selecting who you serve. Be sure to hit "Save" once you're done!